Coordinating tactics between sales and marketing teams is essential for creating maximum impact, high-performing brands. In order to achieve this success, communication is key. Developing a clear communication roadmap for brand management can enhance brand awareness, increase market expansion and help to really make an impact when trying to reach patients and physicians. Provided below are three tips that can be incorporated into an integrated plan to achieve brand success. 1) Communicate & Reach Targeted Physicians – Reaching out to physicians to help with marketing brand awareness is challenging. In order to overcome these cross-industry barriers, top sales teams have used the following tactics depicted in the slide provided below. 2) Use Targeting Tactics- At key points in life cycles, high performing sales reps employ “targets within targets” to drive sales and market share. 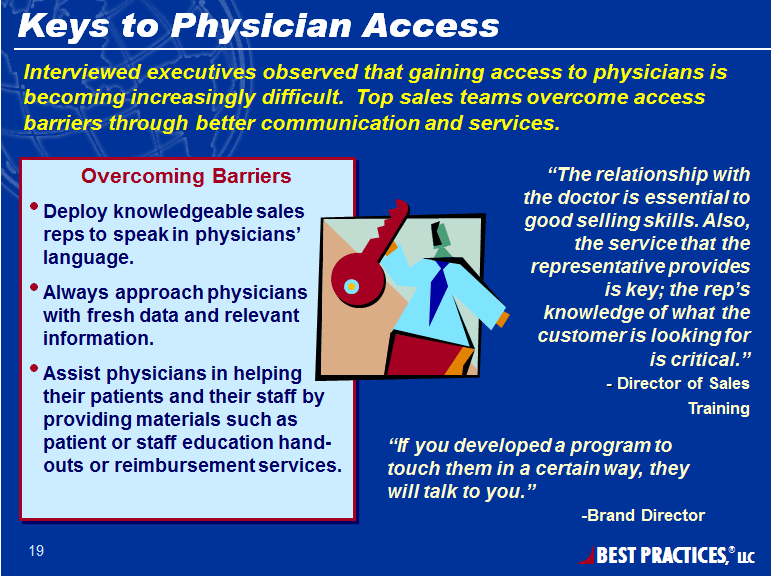 Sales reps often use targeted lists when reaching out to physicians. During the first 6 to 9 months of a new launch in particular, it is critical to focus on a super targeted list of the top 50 to 70 doctors. 3) Alignment of Sales Teams & Marketing Messages- Ensuring that marketing messages & and team sales efforts are aligned requires lots of communication. Coordinating these messages allows sales teams to better develop target lists and can ensure message appropriateness. Identifying which winning strategies and practices leading companies have utilized for brands in competitive markets can encourage brand success. By using active communication, executives can coordinate their messages, target the correct audiences, and ultimately build brand loyalty among physicians.